Our February 2018 sale has been a resounding success with 13 lots being offered and 12 being sold showing the Auction market is still strong. Five of the lots being offered were investments with a HMO License and they achieved particualry good prices. Auction House Northamptonshire is acknowledged as the leading auctioneer in the county, selling more than half of all auction lots every year. Run by auctioneer Richard Greener, it consistently delivers high success rates (90% in 2017) and they specialise in the sale of houses, flats, cottages, barn conversions, building plots, bungalows and commercial buildings. We hold six auctions each year and take entries from all across the county including Corby, Kettering, Market Harborough to the north and east of Northampton, across to Daventry, Towcester, Wellingborough and Banbury to the west. 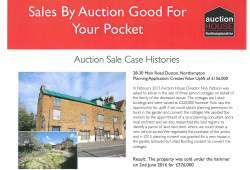 If you have a property in Northamptonshire that might be suitable for auction please call us for the best possible result. If you are one of the many buyers out there looking for a building plot you will know that in the villages to the north and west of Northampton they are as rare as hens teeth. One of the problems is that Daventry District Council have fulfilled their five year housing supply target and as a consequence they are now applying a tax known as Community Infrastructure Levy to new permissions granted after April 2016. The tax is £220 per built square metre so if you are building a 2000 square foot house thats 185 square metres and £37,160 for Daventry Council. The only way around this is to build the house for your own occupation but the policy is stiffling the supply of small development sites as landowners refuse to release the land to the market whilst the levy is in place. The photo in this article is of a rare plot in Pitsford which was in excess of half an acre and which sold in July for £375,000 to an owner occupier but ask me how many other plots I have for sale right now and the answer is one small one in Cogenhoe. This situation will get worse as the drought conhtinues or until Daventry District Council change their policy of restricting consents for plots in rural areas. 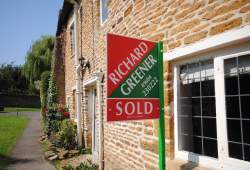 Contrary to many press reports and dire warnings of pre-election nerves the property market in Northampton has started the year with record results for Riachard Greener Estate Agents. January and February saw the residential sales team hit the ground running from the very start of the year and this pattern has continued on into March. The two week period commencing 23rd March and ending 3rd April saw no fewer than 21 properties sold subject to contract with the result that we are now in need of new instructions in many sectors of the market to satuisfy the needs of eager buyers. The biggest surge in interest has been in three bedroomed properties within the town in the price range £130,000 to £260,000 however there have also been a number of successful sales agreed higher up the price scale in the popular suburbs and villages close to the town. Demand for rental properties has also been high which is pushing up rents in the private rented sector with many properties now letting for as much as £50 a month more than at the same time last year. The Chancellor's Budget has spelled more good news for the property market with a special ISA for first time buyers saving for a deposit and an economic outlook that makes it highly likely that interst rates will remain at record low levels for the forseeablre future. Add this to the recent reduction in stamp duty rates for the middle market and the future for buyers and sellers is looking much brighter than at any time over the last few years. Diminutive Northampton Estate Agent Richard Greener (height 5ft 6ins) was delighted to win a national award at the Auction House UK 2013 annual conference held in Warwickshire. Auction House is the largest residential property auctioneer in the UK with 35 branches across England, Scotland and Wales and has this year maintained the number one position for the company completing the largest volume of properties sold by public Auction. 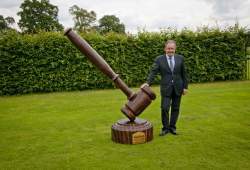 Richard, pictured here with a giant Auction House gavel, was awarded the Best Small Auctioneer of The Year Award in 2012 and scooped the same award again in 2013 after achieving a record 91% average of lots sold through the Northampton sale room. 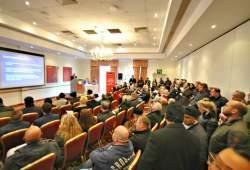 Richard Greener estate Agents joined Auction house in 2010 and are now recognised as market leaders in property auctions in Northampton with sales in excess of £6.7 Million so far in 2013 and regular auctions held at The Hilton Hotel, Collingtree once every two months. The next sale is on Wednesday 16th October 2013 For catalogue details go to www.auctionhouse.uk.net or contact Richard Greener on 01604 259773..
As 2012 draws to a watery close it is time to reflect on the sucesses of the past year and to look forward to the challenges of the year to come. House prices have stubbornly refused to rise in the past twelve months but have been equally reluctant to fall as many comentators predicted they would. What did happen in 2012 was that the volume of sales completed in the year increased. 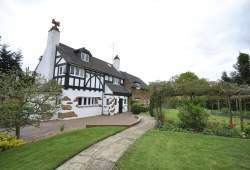 At Richard Greener Estate Agents we saw a 12% increase in sales and much of this was due to the popularity of our Auctions which were attended by over 700 buyers throughoput the year. Our last sale was in November and throughout 2012 we sold Lots to the value of £6.7 Million at a sucess rate of 80% of lots offered going under the hammer or immediately afterwards. There are six sales booked for 2013 and the first of these is on 12th February at The Northampton Hilton Hotel at Collingtree. Click on Auctions to view the lots on offer and if you are keen to sell by the quickest and most straight forward method please call our auctions team for a free marketing appraisal. Local property auctioneer Auction House has won the gold award for Best Franchise at the Estate Agent of The Year Awards, at a glittering award ceremony in London. The awards - widely recognised as the benchmark for excellence throughout the estate agency industry – were held at The London Lancaster Hotel presented by explorer and globetrotter Ben Fogle. Richard Greener from Auction House Northampton said: “This is a fantastic achievement for such a young brand and testimony of the importance of offering auctions alongside estate agency services. Our regional approach with expert local knowledge appeals to local buyers and sellers, with better prices being achieved as a result. The brand’s auction room in West Yorkshire also won the silver award for Best Auctions Agency in the UK – the first time that an accolade for this category has been awarded. Auction House UK was formed in July 2007 and is now the largest auctioneer outside London, accounting for 8% of all property auction sales nationally. The company, which is run on a license basis by Auction House UK Ltd, will hold 150 auctions in 2012 comprising up to 3,000 lots, with clients including local authorities, housing associations, plc landlords, government departments and financial institutions. Richard Greener added: “This success comes on the back of our best November sales figures ever, and a cumulative success rate of over 80% - well above the national average. Over two hundred potential house buyers were present at the Auction House Richard Greener property sale last week when eight out of ten lots were successfully sold under the hammer. The “star of the show” was undoubtedly Lot 8 a tiny detached bungalow dating from 1928 and built almost entirely of asbestos! 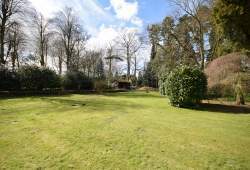 The property had not been for sale for over 80 years and stands in protected woodland in the popular Northamptonshire village of Sywell. Several other properties were sold in the room including a large Victorian house on East Park Parade which fetched £342,000 even though it needs modernising and a mixed commercial and residential investment in Abington Avenue which made £166,000. In 1980 I became the proud owner of a Triumph TR7 two seater sports car. The colour was white and the aerodynamic wedge shape of the bodywork was considered a step up from the succession of tired old MGB’s I had driven throughout the 1970’s. The TR7 had pop up headlamps which never seemed to pop up at the same time and it also came with twin carburettors which regrettably suffered from the same malfunction. The consequence of this was that the engine would purr like a kitten for about three weeks and then would cough and jerk like a Kangaroo for the next three weeks. Not only did this make my passengers sick but also cost a fortune in garage bills because the much vaunted twin carburettors had to be regularly tuned to work in unison. Those were the days when cars had “character” an early 1980’s euphemism for a complete pile of rubbish! What’s the relevance of all this to the property market? Well if you’ll forgive the Noel Edmunds style “segue” I think the market is having a TR7 moment. There’s been much in the press this summer about the dangers of a double dip recession and falling house prices but am I bothered? No I’m not. Recent figures of encouraging growth in our economy and those of the USA, China and India bode well for the medium term future and this data does not sit comfortably alongside predictions of falling prices and volumes in the UK property market. I may not be in the driving seat but from where I do sit my prediction is that if we can get the twin carburettors of housing demand and the availability of credit to work in unison then the market will once again purr like a kitten instead of the stop start situation we find ourselves in today. If current levels of demand are an indicator of what’s around the corner the double dip will be nothing more than a cough and a splutter on the road to recovery. I now drive a Range Rover, that’s another car with character!